The long wait is over! We are proud to reveal the awesome cover for our book, High Tide, Low Tide: The Caring Friend’s Guide to Bipolar Disorder. 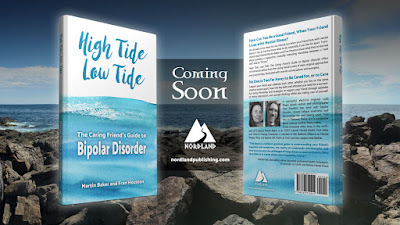 High Tide, Low Tide: The Caring Friend’s Guide to Bipolar Disorder will be published by Nordland Publishing, October 2016. Hello - thanks for your question! High Tide, Low Tide will be published initially in paperback and then also in Kindle / eReader. You can follow our Facebook page www.facebook.com/GumOnMyShoe to make sure you don't miss out on further updates!